With a light dusting of snow on the ground, the shop relocation has begun in earnest. Some tools can’t be relocated. My beloved tablesaw will have to remain up in the barn. It’s too big to get in the shop without dismantling it, and even if I did get it in over muddy ground I wouldn’t be able to do anything else in the shop, there just isn’t enough room. Similarly, the jointer will have to stay up in the barn. I don’t use it often enough to justify trying to move that hunk of cast iron down the slope. Like the tablesaw, it will have to remain in the barn and I’ll just have to clear a path in the inevitable snow bank when I want to get up there to joint something. To prep them both for winter I’ve applied a thick coat of paste wax to help prevent the surfaces from rusting. It won’t stop it completely and I noted that it had already begun a little on my table saw. Time will tell how effective that will be. However, the bandsaw, the compound sliding mitre saw, the planer and drill press have come down. Apart from the planer, they are on their own stands and don’t take up a lot of space. I might end up putting the drill press on wheels as it’s in the corner of the room, but I haven’t yet decided. In another corner of the room, I still haven’t got rid of the ancient wood burning cook stove. It weighs too much to put out during spring/autumn clean up. Currently it has a pile of junk on it. I really ought to clear that off to use as an assembly area. The stove is a little short for me to use as a workbench for power tools, but I could use it for glue ups and putting finish on projects. Next to the stove I’ve lined up the mitre saw on it’s stand. There’s enough space I can cut down most lengths of wood. Anything longer than I currently have space for and I can open the door to the mudroom. I also have my old Black and Decker Workmate workbench. It’s very low which is ok for hand tools, but a PITA for power tools. I’ve found some blocks of wood I can put under the feet to raise the level up to a more manageable height. I’ve also got a slab of pine which came from the top of an Ikea chest of drawers which recently self destructed. It’s surprisingly flat and the vise in the workbench means I can clamp the top down when I want to use it and break it down when I need the space to do something else. With the work top in place, it almost doubles the work space on the top which is far more usable. There are still a few tools in the barn, but that’s going to have to wait till I finish my current project: My contribution to the Wood Workers Fighting Cancer build for 2013. This year it’s a “Young Artist’s Easel”. I’m building it from some red oak I picked up earlier this year from Kijiji. Most of the consignment came as 12/4 stock, which meant ripping a lot down to 3/4″ stock. When saw mills are cutting lumber from the trees the wood is never dry at that stage. They cut it by 1/4″ increments. 12/4 is 3″ wide when they cut it. However at that point it will begin to dry and in so doing will shrink, twist and bow. My 12/4 red oak is rough sawn, the same as if it just came from the saw mill. The good news about this stock is that because it’s thick, there isn’t a lot of bowing and twisting. There’s some cupping but not a lot, and it can be quickly cleaned up on the jointer. Having milled some of the oak, I was able to cut it down ready for the project. After making a lot of saw dust, I realised the fence on my saw was misaligned. The distance at the back of the blade was closer by around 1/8th” (a little over 3mm). This is potentially very dangerous. The blade on the saw rotates, so the front of the blade pushes down against the table top, but the back of the blade has nothing stopping the blade from lifting the work piece up and causing “kickback” (NB: Do NOT watch this video if you are at all squeemish. There’s no blood but it freaks me out every time I watch this one). Fortunately I always use the blade guard on my saw unless I absolutely have to (which is incredibly rare). From now on I’m going to pay a lot more attention to the fence alignment. But because of that alignment there were a lot more saw marks on the surfaces than I really should have to deal with a sander. Most of that was cleaned up with the planer. Having cut down a lot of the wood, I realise there are quite a few splits and the odd know. Some are terminal, others are repairable with epoxy resin. This is why the wood was a cheap as it was. This has slowed the project down quite a bit as I’ve had to replace the odd piece, and other times I’ve had to wait for the epoxy to harden. I’ve gone through nearly a syringe of epoxy too. With all the parts cut to size, I had a decision to make. Should I brave the cold temperatures, or try to cut them with my router. I’ve had some success with the table saw so I figured it was time to try a different technique. After all when the snow falls in earnest I will want to spend as little time as I possibly can with my table saw, so I opted for the router method. The bandsaw can be used to cut the ends of half laps, but not so useful in the centre of pieces. When gluing two wood surfaces together, ideally you want to join them so that long grain is facing each other. 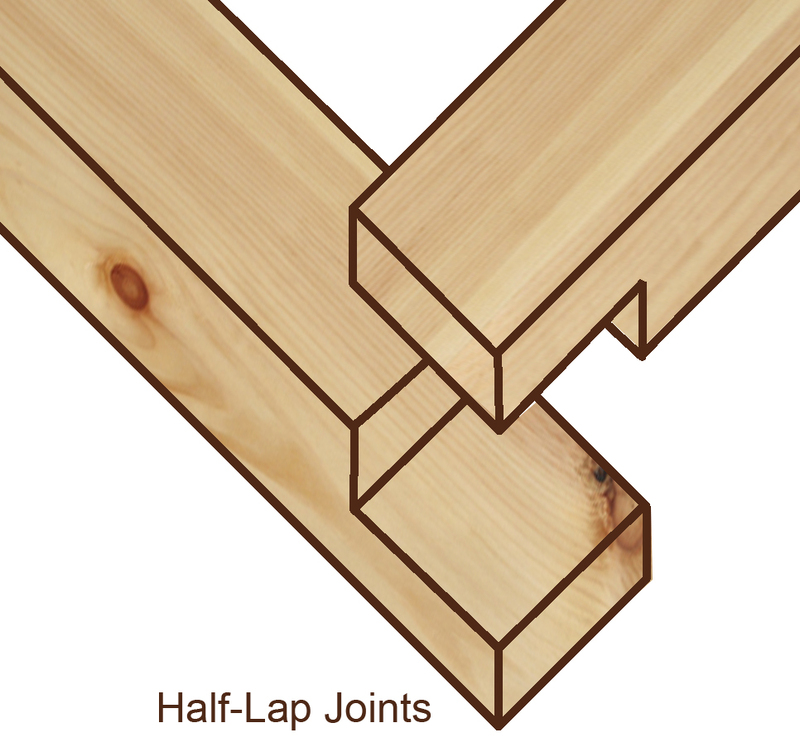 Either running in the same direction as each other, or in the case of the half lap joint running perpendicular to each other. A half lap joint is very strong because of this grain direction and a quick joint to cut. It’s also not a very complicated joint, but it’s also not a particularly pretty joint. The mortise and tenon joint is stronger and prettier, but more complicated to cut. Having marked out the joint on the surfaces, I proceeded to cut the half laps. Things didn’t go quite according to plan and all the joints are a little sloppy. I’m hoping long term this isn’t going to be a problem. Some practice required! However, the surface areas are quite large and I’m sure they’ll hold. If it falls apart, there are always screws! After the glue dried, I went on a mammoth sanding session during which I sprained my left thumb with the random orbit (RO) sander. The RO sander is superior to other sanders because the patterns left by the sand paper don’t immediately attract the human eye as a repeating pattern. It’s there but no where near as obvious as palm sanders and way better than the belt sander. The sander is just about big enough to fit in my hand but it stretches my thumb a little. Once you turn it on, then the vibrations impact the muscles and tendons by vibrating them like the sandpaper. I think I might need to manufacture a handle to make it more comfortable to use in the future – not too difficult with a bandsaw and some plywood. All the pieces are now sanded so I cut the rabbet needed to take the boards. This is quick and easy with a rabbeting bit and the router. Put the rabbeting bit in the router collet. Drop the bit down so the cutting edge is flush with the base of the router. To set the depth of cut, use something with a known thickness between the depth stop and the depth stop turret. Often people will use finely engineered set up bars, milled to thousands of an inch. I don’t have them, but I do have a LOT of drill bits with a huge range of widths. They work well enough for this kind of purpose. The work pieces are 3/4″ thick so I used a 3/8″ drill bit to set the depth stop. Using the turret I cut it in two passes. This makes the work easier on the tool, on the router bit itself and I’m less likely for the bit to tear out the wood. The router I used was the heavier of my two routers which on reflection was a mistake as it was more difficult to control. If I were to do this again, I’d use the lighter router as it is less likely to tip off the narrow pieces. It has enough power, but it’s currently sat on a shelf in the barn still. With the rabbets cut I now have the sizes for the boards. I cut those on my table saw. I finished the day’s work by putting a coat of primer on the surfaces of the boards. This is oil based and has stunk out my workshop. Respirators FTW! Now the primer is dried, I need to give the boards a light sanding and a second coat of primer. The surface is a little rough with quite pronounced grain pores, so it may take a few coats and sanding between coats to smooth that out. Finally I’ll apply a couple of coats of blackboard paint.